What follows is a set of misadventures as the family arrives without presents—they were left on the train—and without the usual holiday accouterments—the Christmas trees and turkeys are all sold out. But they are in for a treat as the cottage has been decorated by their unseen friends. So the bears unwittingly save Christmas for their human hosts, yet are still able to enjoy their own fine celebration. And, as with the other books, the bears do so all while cleverly avoiding confrontation with their human friends. 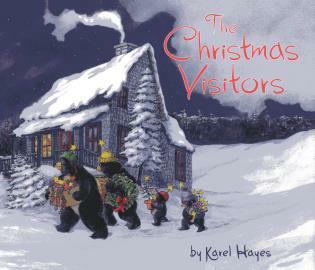 Hayes follows The Winter Visitors and The Summer Visitors with a third story of a gentle ursine takeover of a cottage that’s been closed up for the season by its owners. But when the family decides to celebrate the holidays in the cottage after all, the bears must skedaddle. In a nod to “The Night Before Christmas” one of the children catches the bears leaving a decorative surprise for the family on Christmas Eve night. Hayes’s spare writing can, at times, be inscrutable (“Merry holidays,/ twinkling lights,/ and starlit skies;/ all go round and round/ and off to bed”), though the watercolor scenes of ice skating families (both human and bear) and holiday celebrations are fun and festive. Ages 4–8.